Those books are located in the self-help section two aisles over, and once you’ve bought one, done everything it says to do, and found yourself miserable anyway, you can always come back here to understand why. The problem we face, he says, is that our imaginations are faulty in systematic, predictable ways. He points to the case of conjoined twins who spend every moment of their lives locked together, face-to-face, but who can’t imagine undergoing surgical separation. “Why would you want to do that?” one of them asks. “For all the tea in China, why? You’d be ruining two lives in the process.” A medical historian says this isn’t unique–in fact, he found the “desire to remain together to be so widespread among communicating conjoined twins as to be practically universal.” And yet conventional medical wisdom is that conjoined twins should be separated at birth, even at the risk of killing one or both. This, Gilbert points out, is a failure of imagination. When we imagine how others feel, or how our future selves might feel, we focus on ourselves in the present. If we think we don’t have enough money, we imagine that having more money will make us happier; we can see now, so we can’t imagine that we could still be happy if we were to go blind. But in fact, over a certain level of income, money doesn’t make people any happier, and blind people are as happy as sighted people. Everything he says seems insightful and perfectly reasonable, but I have to say that every time I encounter findings from social psychology, behavioral economics, and related fields, I wonder about how reproducible they are. This is pretty basic concern in these fields, and it’s referred to as the WEIRD problem. Most research of the sort Gilbert talks about is carried out on American undergraduates or people like them; the samples are overwhelmingly from drawn from societies that are Wealthy Educated Industrialized Rich and Democratic. And there is a good bit of evidence that we have little basis on which to extend the findings of the research to the rest of humanity. I suppose this may not be much of a issue for Stumbling on Happiness, which is aimed at people who are probably not terribly different from American undergraduates. But I can never shake the feeling that grand statements about human behavior are being made on the basis on relatively flimsy evidence. By muddling causes and consequences, philosophers have been forced to construct tortured defenses of some truly astonishing claims–for example, that a Nazi war criminal who is basking on an Argentinean beach is not really happy, whereas the pious missionary who is being eaten alive by cannibals is. “Happiness will not tremble,” Cicero wrote in the first century BC, “however much it is tortured.” That statement may be admired for its moxie, but it probably doesn’t capture the sentiments of the missionary who was drafted to play the role of the entrée. This is good stuff. I’d love to take a course from the guy. 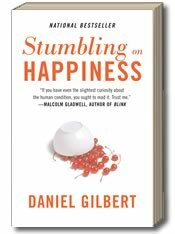 This entry was posted in Learning, Reading and tagged books, Daniel Gilbert, psychology, Stumbling on Happiness by Richard Bowker. Bookmark the permalink.